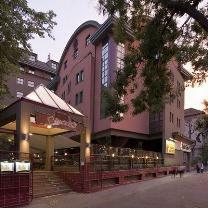 4-star-hotel in the 6th district of Budapest. Address: 1068 Budapest, Dózsa György út 106. Malls, parks, a boating lake, skating rink, museums, the Municipal Zoo and Funfair, Vajdahunyad Castle, Széchenyi Spa. All these and more are to be found close to Ibis Budapest Heroes Square (former Hotel Liget), one of the most attractive hotels in Budapest. Our hotel (termed by some the "jewel case" of the capital) is sited close to one of Budapest's most visited sights, just two minutes' walk from Heroes' Square. Promenades, parks, a boating lake, skating rink, wonderful museums, the Zoo and Amusement Park so popular with children, a famous spa bath, all these can be found close by the Ibis Budapest Heroes Square (former Hotel Liget), one of Budapest's most atmospheric and attractive hotels. The downtown is an easy 15 minutes away, by car or public transport. We know why we are so popular with our guests. After all, we have asked them! A pleasant mood, comfortable rooms meeting all demands, attentive staff, cleanliness, plentiful and delicious breakfast, tasteful furnishings and continuous renewal were all mentioned. In the proximity of the hotel is the Budapest Zoo, the Citypark with a lake, where in winter skating, in summer boating possibilities are offered. Bathing and swimming possibilities are given in the Szechenyi Thermal Baths.